Did you miss out on our recent TG merchandise subscription offer? Fear not! You can now buy all your TG-branded merchandise direct from our official subscriptions site MyFavouriteMagazines.co.uk. Scroll down to view our range of guitar-related goodies. Please note that while all the items are available for delivery outside of the UK, the prices listed here are for UK delivery only. The original and the best, designed by our very own highly evolved in-house Art Editor, John 'Crayons' Blackshaw. Demonstrate the evolution of the guitar player while on the move - it's a 100 per cent guaranteed-infallible theory, as proven by science. Probably. This unique version of the Levy's Leathers DM1 2½-inch guitar strap has been specially produced by Levy's Leathers to include the Total Guitar logo. The DM1 is made from high-quality genuine leather and features suede backing and decorative double stitch. Adjustable from 38 inches to 53 inches. 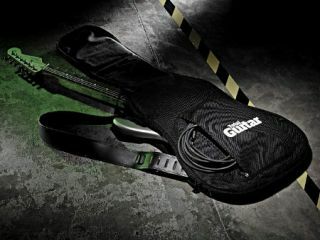 Exclusively available from MyFavouriteMagazines, this high-quality electric guitar gigbag features half-inch foam padding and headliner lining, plus a shoulder strap and an accessory pocket printed with the Total Guitar logo. Browse all of the MyFavouriteMagazine music range at myfavouritemagazines.co.uk/merchandise/#Music, and while you're there, have a look at the latest Total Guitar subscription offers.